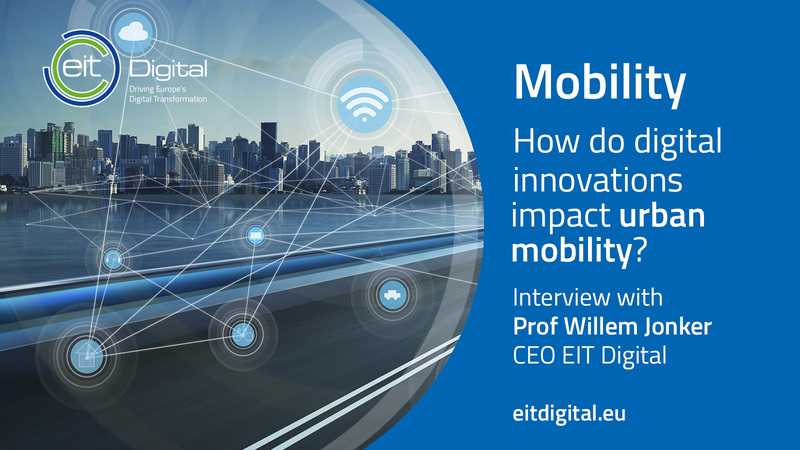 Willem Jonker: "We are now in the age of a new mobility, centred on the user's needs rather than the vehicle's limits"
We met with EIT Digital CEO, Willem Jonker, and discussed the impact of digital innovation on urban mobility. Digital cities, infrastructure and wellbeing are some of the main drivers of innovation within EIT Digital's Action Lines. The organisation uses a multidisciplinary approach combining research, higher education and business development to create innovative solutions and business models to solve some of Europe’s societal challenges. With this holistic vision of digital challenges, EIT Digital CEO Willem Jonker gives his insights on the future of urban mobility. What does digitisation bring to urban mobility? WJ: What you see is that digitisation allows mobility to shift from being only about the mode of transport to becoming fully about the individual’s needs. In the past, you said, “I need to take my car, catch the train, and ride my bike.” We thought first about our means of mobility and travel plan. What digital brings is the ability to think beyond those limits: “I need to get there - how do I get there?”. With the development of technologies, you get all the info that allows you to plan your mobility needs from point A to point B. What were the main steps to this new mobility paradigm? WJ: The first was the shift from paper versions of road maps and bus and train timetables to digital versions. Second, was the arrival of mobile, enabling these new platforms to be always with you, in the palm of your hand. But even today, mobile devices offer siloed information: there are multitudinous car/train/subway applications, but we’ve only started to get overarching applications to bridge these various solutions. They are still marginal, and you can’t find many all-inclusive apps apart from Google. Digitisation allows you to combine mobilities with modalities. The real disruption will bring about the disappearance of the service provider monopolies as one of the key pillars of mobility. You will be able to better plan and choose the best option for you from a user point of view, and not from the service provider’s point of view. This new business model is only starting to emerge. Is it easier to plan/has planning a trip changed with digitisation? WJ: Another key trend is that with all this information at our fingertips and 24/7 connectivity, a lot of navigation apps are now collecting data in real time. Planning is becoming more about planning on the go as opposed to planning before you go. We are far more aware of what is going on around us with real-time updates and can quickly adapt to our needs and to the problems we might find on the way like traffic jams. Now, we plan our navigation as we go. What would be the role of AI in urban mobility? WJ: AI will assist the user in his planning, by allowing rapid and complex multimodal trips adapted to his environment. AI can also bring safer and newer processes to enable seamless mobility in a more secure way. It will be more adaptive, more intelligent support thanks to AI and dynamic information and there will be more players in the market to help you undertake seamless travel. Who are the new players in the mobility sector? WJ: There is, of course, a non-IT element of the new urban mobility: people. They will approach mobility in a holistic way. New players will plug the holes of transportation, with new services that existed before such as bike and car sharing and last-mile delivery. And these forgotten tracks of mobility are the essence of digitisation in urban mobility. Modality switches are also complicated. It was difficult to jump from a metro to a bus then walk to the train station using your mobile apps. New players will be able to deliver mobility changes in a traveller-friendly way. Digital mobility can become hassle-free mobility. What about the use of data in the digitisation of mobility? WJ: As in any industry, these new mobility applications and services will rely on data because of the need for traffic data, user data and IoT device-to-device communication. Of course, user data privacy will be key. There needs to be a way to anonymise this data-intensive mobility and offer a solution to safeguard the privacy of individual travellers. How can you protect privacy in digital mobility? WJ: There is now a dual approach to privacy in data-centred business models: is the data collected for the application use-only or can it be monetised by the service provider? The two options are clear: either the service is for free - with shareable user data - or the service is paid for and you pay to protect your privacy. What is the place of autonomous mobility in digital cities? WJ: Autonomous systems can play a role in filling the gaps in your travel plans: from public to fleet to on-demand, autonomous solutions. You will be able to get the autonomous car at the exit of the metro station at the precise moment you need it. This requires the autonomous system to work and deploy and be connected in real time. Autonomous systems put more constraint on the city network. The resilience and sustainability of the infrastructure is the key to autonomous mobility.